I have a soft spot for scented candles. Burning scented candles leave a lovely ambiance in your home – it truly turns a house into a home, especially in winter. Since we don’t have winter in Malaysia, I like burning candles in the evenings or in an air-conditioned room. Somehow, the scent lingers better. These days, I’ve been relaxing with Dirt Candles’ Take it Easy – a lovely blend of lavender and vanilla scents. 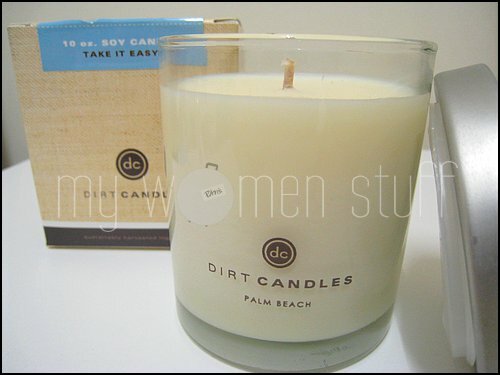 Dirt Candles are natural soy candles infused with blends of essential oils to create the mood you want. Unlike other scented candles I own, I find the scents in Dirt Candles longer lasting yet mild. Just sniffing the new candle relaxes me right away and leaving the candle in a room without burning is good enough! The smell is sharp but not chemical and the scent fills the room beautifully without being overpowering. It comes with a cover so you can cover it up when its not being burnt which also stoppers up the scent. One thing I noticed was that when I blew out the candle after a while, there was no sharp acrid smell I usually get when a candle goes out – the smell remained pleasant and it lasts a long while. Lately, to unwind, I’ve been combining Dirt Candles with The Best of Olivia CD – Olivia Ong is a Singaporean singer with a lovely crystal clear voice that sends shivers down my spine. She sings in English and Japanese and I discovered her CD during a dinner at a Japanese restaurant where her songs were playing! Oh and one more thing, because its 100 organic soy, you can dip your finger in some of the melted wax and apply to your skin as a scented body cream. I tried it and to my surprise it works and I did not burn my finger. There is no waxy feel and it feels nice and light on the skin plus the scent is lovely and warm. Have you tried burning scented candles? What’s your favourite type of scent? I tend to go for fresh or relaxing scents – lavender, patchouli, citrus etc Food scents don’t quite grab me though I know some people love them! Note about candle safety: Never leave candles burning in an empty room or while sleeping. Always place candles on a flat smooth surface. Use a flat coaster to prevent marks on your table. Never burn candles by an open window or near curtains or flammable material. PREVIOUS POST: LovingMinerals Sale, Free Clinique Foundation, Estee Lauder Blockbuster Kit… and Giveaway winner! Aww… Thank you! Do try these – you won’t want to go back to normal scented candles again, I promise! Besides they do last a very long time despite the price. That’s the beauty of soy candles, they last way longer than normal ones. I’m going to get me some of those. Even though they’re more expensive, it sure is cheaper in the long run than to get conventional scented candles which only last less than 10 hrs. I must agree with you. These are my first soy candles and I’m amazed at how long they last and how lovely the scent is – not artificial at all. You can use the melted wax as a cream?? Fuyoh! Yes you can! Its amazing! Ooh so luxurious. I adore candles and scented candles. I used to love Ikea’s lavender ones – but they’re GOOONEEE. Heartbreaking. Ooooh, I lurve Olivia Ong.. She’s one of my favourite singer.. You should try to get her other CD “A girl Meet Bossanova 2”! It’s good. There’s been much discussion about Wedded Bliss… even though the name might be offputting for the single gals, it’s one of my favourites. The peppermint with the lavender is a great mix. Also would highly recommend Heart Breaker, Beach Bum and Nitty Gritty… even though they might sound strange, they’re really quite nice. Nitty Gritty has a unique scent and is quite a heavy scent for those who like it. For those who like their vanilla, look at Old Faithful – 4 different types of vanilla in one candle!